Almere is not your ordinary Dutch city. 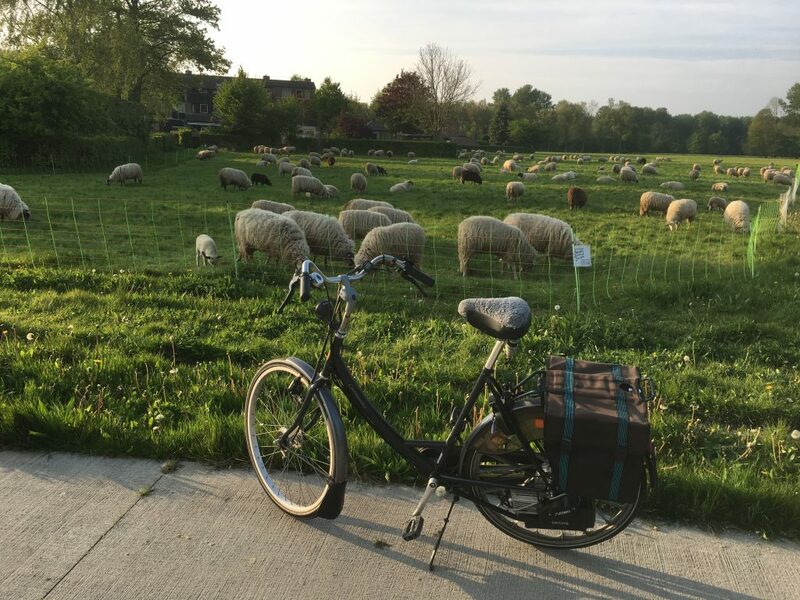 “Almere is the most secure city for cycling in the Netherlands. The city has a system of 500 kilometers of cycle courses, for the most part separated from traffic and with a surface of black-top. Cyclers have the right of way and crossing roads or bus lanes is very rare. A large number of bridges and underpasses make Almere a city without boundaries. In fact bicycling is so good in Almere it was nominated as best cycling city in the Netherlands. The residents of Almere seem to be happy. Over 80% of them consider the bike network to be exceptional with their only complaint being the lack of good lighting in some parts of the bike path network. Almere is a new planned city. It didn’t exist in any fashion before 1976. Where the city is now used to be the bottom of the North Sea. The water was pumped out in the 1960’s and the city began construction a decade later. Almere is the main city in the Southern Polder, while Lelystad in the main city in the Northern Polder. The Knar dike separates north from south in Flevoland and bisects the province about halfway between Almere and Lelystad. Because Almere was the second planned city, the could correct some of the mistakes made in Lelystad. The major one concerning bikers is that in Lelystad most crossing were dont by 5m high bridges. That sound fine until the wind is blowing 50 mph and it raining making those bridge surfaces very difficult to navigate. In Almere, almost all crossing are done by underpass requiring the cyclist to only have to pedal 1m-2m uphill. This was modeled after Stevenage in the UK, another planned city. Each vehicle road in Almere was raised 1.5m, while all cycle tracks were submerged 1.5M to give the leeway for underpasses without requiring steep inclines. In rain and winter these underpasses also serve as protection for bicyclists caught in a rain howler. 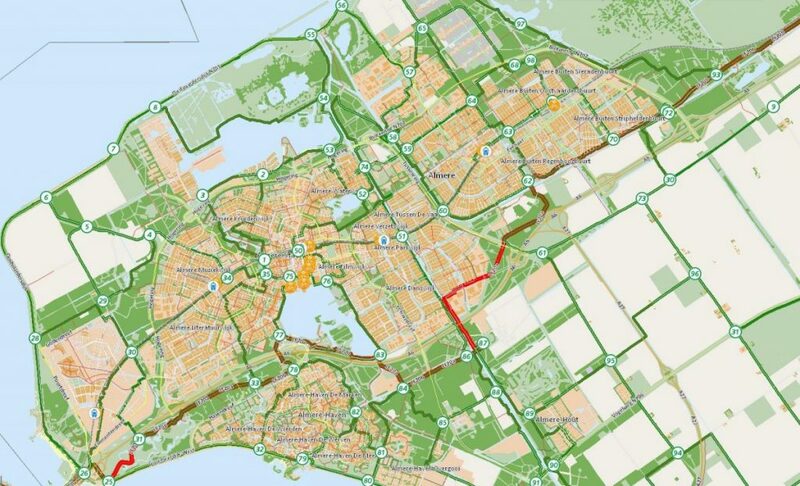 Almere’s bike paths are shown in red while vehicle roads are shown in dark. Where the two meet underpasses were constructed. In Almere there are two sorts of Bike Paths. A Fietsstraat is regularly 3 meters wide, dark top, and is frequently blended with auto streets or sidewalks. A Fietsbaan or Fietsbaanpad, is 4 meters wide, red topped, and is a separate bicycle path with a dashed centerline for direction and passing. Throughout Flevoland the bicycle paths are numbered. You can get a map of the bike path network at the Almere VVV in City Mall. Google actually does a decent job of guiding bikers who use Google maps on their phone. Between a cell phone and the bike path signage, it is quite possible to bike all of the Netherlands and never get lost.